Three successive explosions, killing at least 11 people and injuring 17 others, have gone off at the Jazeera Hotel, one of the most secure areas in the Somali capital, Mogadishu. 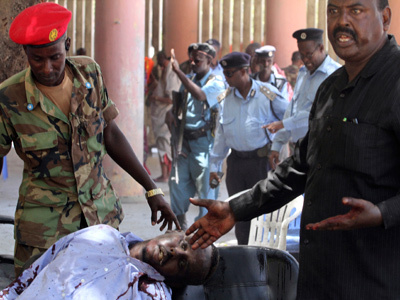 Abdikadir Abdirahman, the director of a local private ambulance service, reported the death toll to Reuters. Two bombs, which exploded almost simultaneously in the hotel, were followed by heavy bursts of gunfire by Somali security forces. "First we heard a big crash and the security forces immediately opened fire," said Abdullahi Hussein who lives just 300 meters behind the hotel. "After a few minutes another explosion took place and there was more gunfire." The third explosion, which took place about an hour after the first two blasts, was caused by a car bomb which went off while the vehicle was being searched by the military. Harun Maruf, a Voice of America journalist in Mogadishu, wrote on Twitter that security sources say the first blast was caused by a suicide bomber who drove his vehicle into the hotel’s gate. It is believed that Khalif Ereg, the Mogadishu intelligence chief who survived an assassination attempt in March 2013, was staying at the Jazeera Hotel, although it is not clear if he was the target in the bombing, Maruf wrote. Sources: Ex #Mogadishu intelligence Chief Khalif Ereg who survived an attempt in March 2013 was at the hotel. Unclear if he was the target. The Jazeera Hotel, where the blasts happened, is considered to be one of the best-guarded places in Somali capital. It is located not far from the country’s international airport. Somali PM Abdiweli Sheikh Ahmed condemned the attack and expressed condolences to the victims and their families. "This year, 2014 is going to [see] the strengthening of Somali forces and the elimination of the extremists," Ahmed said in a statement. 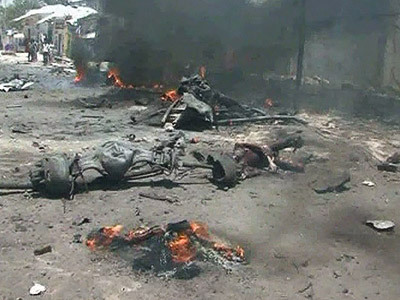 The Somali rebel group Al-Shabaab, which has been carrying out a campaign of terror attacks in Mogadishu over the last two and a half years, has claimed responsibility for the blasts. The bombs targeted intelligence officials who were meeting at the Jazeera Hotel at the time of the attacks, the group said. 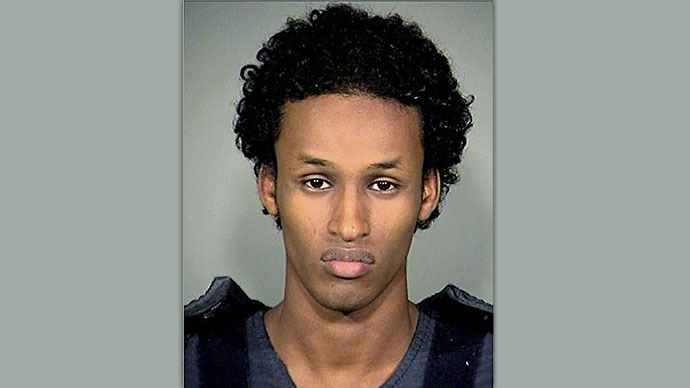 "The apostates are the eyes and the ears of the invaders… These attacks serve as a well-deserved punishment for their role … in their crusade," Al Shabaab spokesman Ali Mohamud Rage said in a statement. Suicide bombers attacked the Jazeera Hotel in September 2012, trying to assassinate the then newly-elected President Mohamud, who was giving a news conference there. He and the Kenyan FM who was visiting Mogadishu were unhurt in that assault. The Somali capital has been frequently targeted by fighters from the Al-Qaeda-linked Islamic extremist rebel group Al-Shabaab, which ruled Mogadishu from 2006 until August 2011. When African Union (AU) and Somali forces pushed them out of the city in 2011, the extremists launched regular attacks on the country. In April 2013, two car bombs exploded outside the city’s Supreme Court before gunmen stormed the building and opened fire. 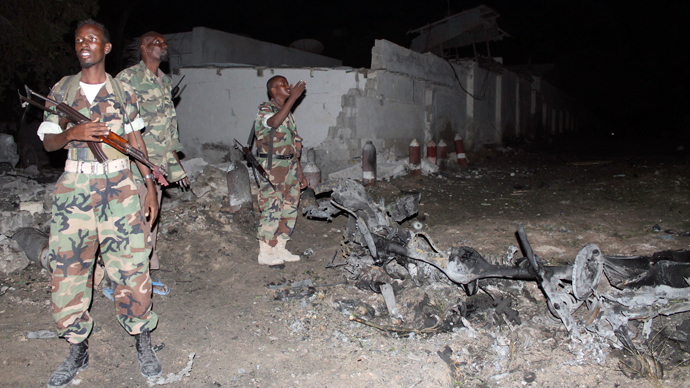 A large explosion in an area near the Mogadishu airport followed hours later.